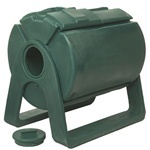 Compost Tumblers and Bins | Free Shipping & Handling! Compost tumblers and bins are not only eco friendly; compost tumblers help your garden, too! Also known as "black gold," compost is highly beneficial in gardens and will help your plants grow larger and faster. The Sun-Mar compost tumblers shown below produce compost aerobically, meaning little to no odor and faster turnaround time. 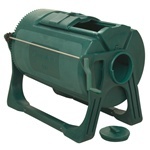 However, not all composters from Home Products 'n' More are aerobic units, we do also offer some anaerobic compost bins. For more information on the difference between aerobic and anaerobic composting, please visit our Composter FAQ Page. If you're interested in other eco friendly products, please be sure to visit our category of eco friendly outdoor furniture! We offer products made of recycled plastic composite material. These products are durable and long lasting, and they won't rot or decay like wood. We also offer a line of log cedar garden furniture. Did you know that log cedar is a byproduct of the log cedar home industry, and that the wood comes from sustainable forestry? For more great products for your home and garden, look no farther than Home Products 'n' More! If you're looking for a gift item for the gardener in your life, you've come to the right place. We have hundreds of products to enhance your outdoor living spaces--from outdoor furniture and lighting to arbors, trellises, and pergolas, and everything in between! If you enjoy gardening, you might be interested in our line of aluminum trellises. We offer fan and ladder style aluminum trellises in a variety of sizes ranging from 24 to 108 inches tall! Aluminum is a great choice for a metal trellis because it's lightweight, yet still very durable, and best of all, it won't rust like steel! Our aluminum trellises are designed to fold up for easy storage during the off season, and they also feature our unique trellis training clips. No more using twine or string to tie plant to the trellis! These trellis clips fit right into the trellis and can be positioned wherever they're needed. They easily hold up plant stems and tendrils while training them to climb the trellis, and they won't choke the plant like some other tying methods. Our aluminum garden trellises are all powder coat painted for durability, and you get your choice of two attractive colors: white or hunter green. If you have questions about any product you see on our website, please don't hesitate to contact us by email or by calling 800-690-0132. We're always happy to help!